Xplus 2 EC central extract units features long life, low energy use motors and highly energy efficient backward curved impeller. The extract speeds can be set by the installer to match the required Part F extract rates for the size and layout of the dwelling. Suitable for installation horizontally or vertically at any angle, Xplus 2 is extremely versatile. It is typically sited in an airing cupboard or the attic, but with a low profile design of only 190mm it can also be installed in many apartment ceilings or floor voids. 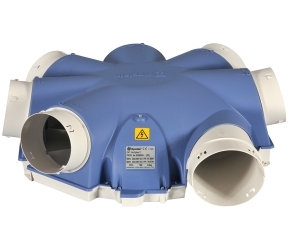 The multi-spigot configuration enables ducting to be connected from several directions reducing ducting resistance, airflow restriction and noise. Xplus 2 EC RF models are supplied complete with the new innovative ConneX radio frequency (RF) controller which uses kinetic energy to generate and send control signals to the MEV unit. This wireless and battery-less control solution reduces installation time and cost as there is no need to run cables between the MEV unit and the controller, making it ideal for refurbishment.